New Hampshire is the destination of most of our family ski trips. 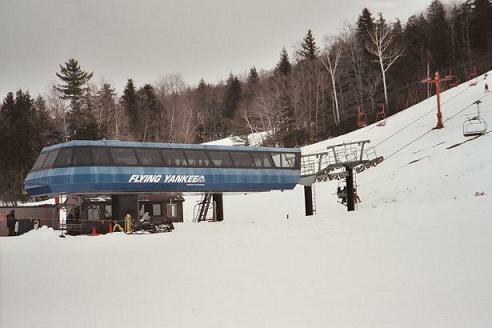 This skiing site reflects our NH skiing experience and contains photo galleries of some of the ski resorts of New Hampshire. 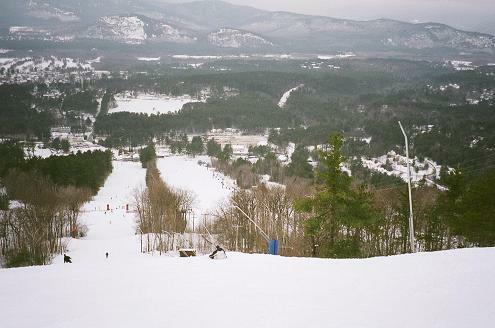 I also wrote reviews of the New Hampshire ski resort we visit most often. Please see the links to the photo/review pages below. Skiing resorts are best viewed from the air while sitting on a chairlift. Click here to watch these aerial previews of New Hampshire ski resorts. Each preview is a slide show exhibiting several photos taken from one lift. For a collection of DVD-quality video clips featuring New Hampshire ski resorts click here. New Hampshire is the center of New England's snow country that extends from Vermont to Maine. New Hamphire is the home of White Mountains. 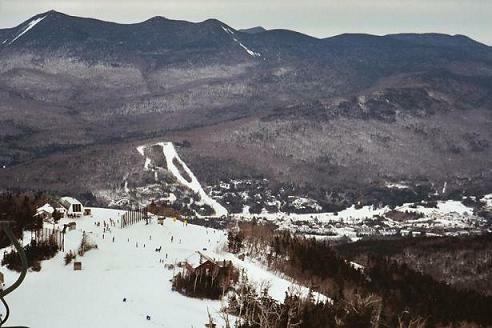 White Mountains serve as an excellent ground for numerous ski resort in the state of New Hampshire. The highest point of White Mountains is Mount Washinton - 6,288 feet. It is the highest point of the US Northeast and is notoriously known for its worst weather in the world. See my pictures of Mount Washington and other New Hampshire scenery. All New Hampshire ski resorts are small but the vertical drop for a few of them is a little bit more than 2000 feet, which is not bad at all given that you usally can drop these 2000 feet or so in a single run. Consider also that most of the resorts there have hi-speed quads. 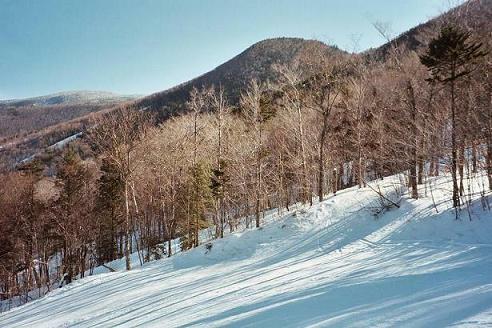 Due to their size, New Hampshire resorts are suited best for shorter skiing trips. I am not sure what adjective to apply to the ski resorts of New Hampshire - I like them. They are close to my home, and thus, accessible on a weekend trip. Because I am not alone in this category, these resorts could be quite crowded, especially on weekends, especially when the weather is nice. Interstate Highway 93 is a major artery via which skiers travel to New Hampshire ski resorts, and it can be crowded too because of travelling skiers - of course. The weather in the region is a special topic. It is one of the most popular conversational topics among locals. It constantly changes throughout the winter from snow to rain, to freezing cold, to beautiful sunny skies. Due to this kind of weather, please expect icy conditions on the slopes. The good thing about these conditions is that if you can ski in New England, you can ski anywhere. Think of New Hampshire's native Bode Miller and read his message to visitors of this site. Holiday dates vary by year. They are days between Christmas and New Year, Martin Luther King Day weekend, the week of President's Day. Maps are loaded from MapQuest. Weather and snow reports are from Weather Channel. Trail maps are from resort official sites. Click here to see a similar comparison chart related to junior skiing. That page also contains some complimentary information such as skiing movies, etc. Also, please find a NH skiing quiz and a game there. Click here to find detailed information on NH hi-speed lifts. 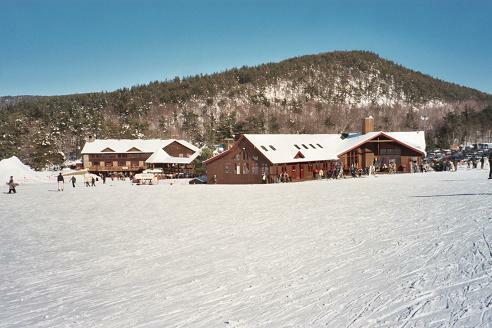 Ski Market orginizes one-day skiing tours from many of their locations in Massachusetts, Connecticut, Rhode Island, New York. To see the schedule, locations, contact info, etc., click on 'Bus Trips' on their front page. Note that the prices of these tours are very close lift ticket prices because they enjoy group rates for lift tickets. The total cost is comparable with the cost of a trip by car. Discount lift tickets? Well ... if you know of a good deal, please drop me email because I would like to know too. First, check ski resort web sites. As far as weekends are concerned, not much one can find on the web sites. But for someone who is more flexible and can ski in the middle of a week, there could be quite good deals. 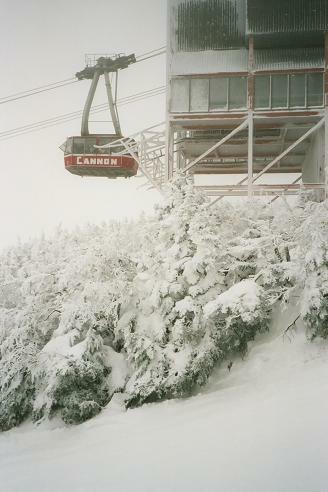 Second, some bigger local companies offer discount lift tickets. It does not hurt to check with HR. Third, discount coupons appear in local newspapers. Again, nothing breathtaking but still. Fourth, early season is the best time to shop for discount tickets. Cheap Skiing Guide publishes info about discounts including lift tickets. SkiCoupons.com is an online discount coupon site. Check out 'Mt. Washington Valley-White Mountains New Hampshire' and 'Southern New Hampshire' links on their page. Two more sites with discount lift tickets are: Liftopia and C & B Sports. 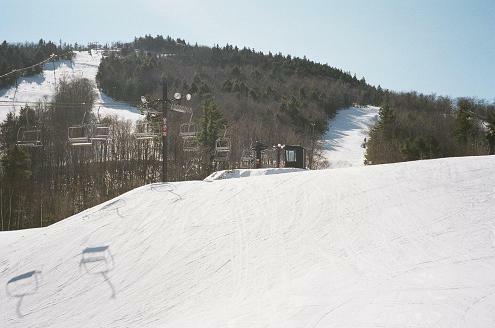 Ride & Ski New England offers a value card that makes one eligible for discounts and many New Hampshire resorts. Check for details on their web site. SkiNH.com offers a variety of discount ticket packages. Fill gas at Mobil stations and get a discount on lift tickets: SKI-3 (check their list of participating resorts). Ski lessons for all ability levels and all ages are available at all resorts listed above on this page. The beginner groups may be big but if you seek lessons at an intermediate level, there is a good chance that there will be only two of you or you may even end up being privately coached after purchasing a group lesson. I never tried myself but judging by my son's experience with these lessons, it works much better when I coach him despite the fact that I am not a pro. He liked some of these lessons though, and they definitely contributed to his skiing skiils. 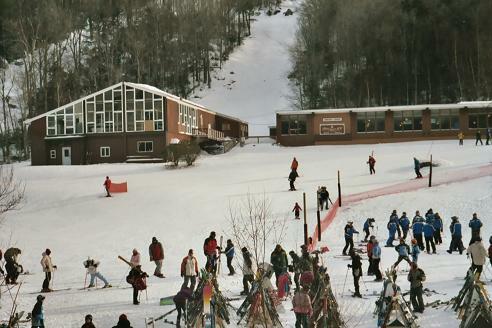 Many ski resorts also offer seasonal programs for both adults and children. I never tried them myself but assume that these programs are more serious and focus on performance. Some ski clubs offer ski training including racing. See the list above. Waterville Valley BBTS offers an academic program in racing for children. NASTAR, which is a recreational ski race program, conducts plenty of competitions at New Hampshire ski resorts. Please check their web site for schedules. NADS is another racing program open to public. Its focus is on downhill racing. Mountain Dew Vertical Challenge is yet another racing program. Spring is the best time for sales on last year equipment. Joe Jones Ski and Snowboard has tent sales in summer. Ski Market has a traditional sale on the Columbus day weekend, and this sale applies to models of the next season. Most of the ski resorts have demo centers as well. Usually, these demo centers specialize in a few brands. It is worth checking ski resort web site to see what they offer for demoing if you are interested in demoing a particlular ski model. If you do not find the model you want on their list, then The Great American Ski Renting Company might have a nearby location. They offer a good choice of brands and models. Some shops tune up skis overnight whereas others may ask you to leave skis for a week. When in rush, it is better to call and check before bringing your skis. Since we have not the best snow on earth but the best ice on earth in New Hampshire as well as in the entire Northeast, sharpening is a must every season or several times in a season depending on the number of skiing days. There are yearly ski expos held in Boston, MA. They are arganized by The Boston Globe Ski & Snowboard Expo. They post the schedule of upcoming expos in advance. Usually, one can find some good deals at the expos on both equipment and ski resort packages, especially on early season packages. Please be afraid though of being trapped into a time share deal. 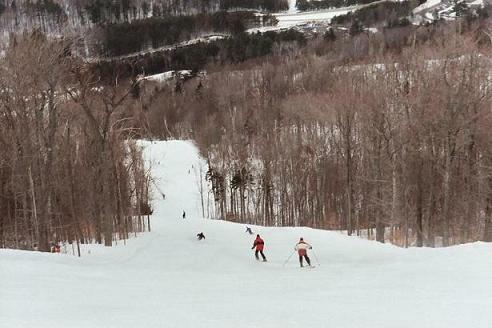 Overall, New Hampshire ski resorts are best for families. There is no much night life around ski resorts. In my experience, the best apres ski time happens when you travel in a company of friends. Then, you are in full control of your apres ski time and not dependent on any facilities etc. For your convenience this site is kept free of advertisement but this is different. Ahla Brookline Food Tour - is a business run by friends. It is in Brookline, MA. Having reviewed their tours, they are definitely recommended to everybody interested to learn about Jewish or Russian cuisine. 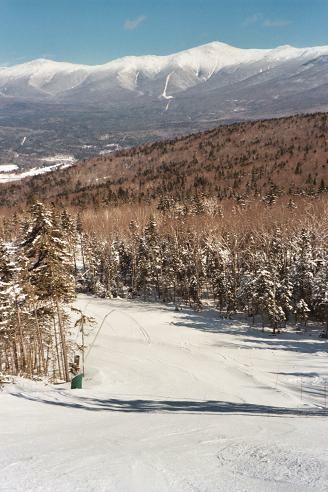 The title photo is a view of Mount Washington from the top of Wildcat.